One day, Jesus, on leaving the synagogue went with His disciples to the house of one of his apostles, Peter. There they found Peter’s mother- in- law confined to bed with a fever. On hearing of it, Jesus went to her and He ministered to her with love and compassion. He touched her, commanded the fever to leave her and she was healed on the spot. We know she was, indeed she got up right away and served them food. Well, the story does not end there. You see, good news travels fast. At the end of the Sabbath, Jesus had to deal with the massive influx of the townspeople. They had heard about the healing and they brought all their sick to receive their share of this unexpected good fortune. Jesus obliged them and the Scriptures tell us that he placed His hands on every single one of them and healed them from sickness and affliction by demons. There are some meetings you would give anything to attend, this is definitely one of them; the joy in the town must have been palpable. Who had ever heard of such a thing? And could it ever happen again? Probably not, we would say, yet we are told otherwise. This remarkable occurrence, we are told, marks the fulfilment of the promise made concerning the Messiah through Isaiah the prophet hundreds of years earlier. According to Isaiah, Jesus would bring healing of sickness and disease as part of His work of redemption. And those who lived in His day were experiencing it even in advance of the cross. How much more should we experience it after the cross and resurrection? God has always healed; it is a part of His nature to heal. Do you know that God has names? I know, you probably thought His name was God. Well, one of God’s names is Jehovah Raphe – the Lord who heals. His names reflect His personality. He consistently promised good health to His people if they would obey Him. It is thus unchangeable as it is fundamental to His being. The story of God’s people throughout the Old Testament demonstrated this fact. Unlike ritual laws that change from the Old to the New Testament, healing as the expressed will of God to bless His people remains the same. The patriarchs lived to a ripe old age; He brought His people out of Egypt in excellent health, and never stopped providing restoration when they called to Him. He promised that if they would be obedient, He would bless their food and take sickness away from the midst of them. Psalm 103 speaks of remembering the goodness of God as He forgives all your sins and heals all your diseases. Disobedience brings sickness. It is not however the sole cause of sickness as we live in a broken world where evil dominates. The important thing is that God desires His people to be well. Look at Jesus. Jesus is the expression of the perfect will of the Father and His ministry was summarised in these terms by the apostle Peter, that He went about doing good and healing all that were oppressed of the devil. On that day in Capernaum He did a lot of good. Healing is God doing good. Jesus demonstrated it, and everywhere He went sick people were brought to Him so He could heal them. Then He sent His apostles out to preach the gospel and also heal the sick and deliver people from demons, which they did. This article is an excerpt from the book REBORN: A New Identity. Find out more here. Healing is the expression of the will of God. Healing is the expression of the will of God. When they asked Jesus if He willed to heal, He said, “I am willing.” When they suggested ‘if you can’ He retorted, “All things are possible to Him who believes.” He could and He willed. And the remarkable thing is that He empowers His people to be as the apostles were, agents of doing good and healing. Before He left the earth He made it very clear that His disciples, us, would do the same works He did and even greater ones. Healing is God doing good. Healing is God doing good. And everywhere that Jesus went He did good and healed all the oppressed. So healing did not stop with the Old Testament, it continued with Jesus and it did not stop with Jesus, it continued with the apostles. We see it in the book of Acts. Once the disciples had received power through the Holy Spirit, they began to heal the sick and preach with boldness. In fact, at one point people brought sick people from all over and were even content to just lay them on the ground so that Peter’s shadow would fall on them. The healings were so dramatic and amazing that they had no doubt the people would be healed just by Peter’s shadow falling on them. Postscript : Friends, God is still healing today. If you need healing, reach out to Him in faith. I pray that the power of God will come upon you now and bring total restoration in your body, in the name of Jesus. 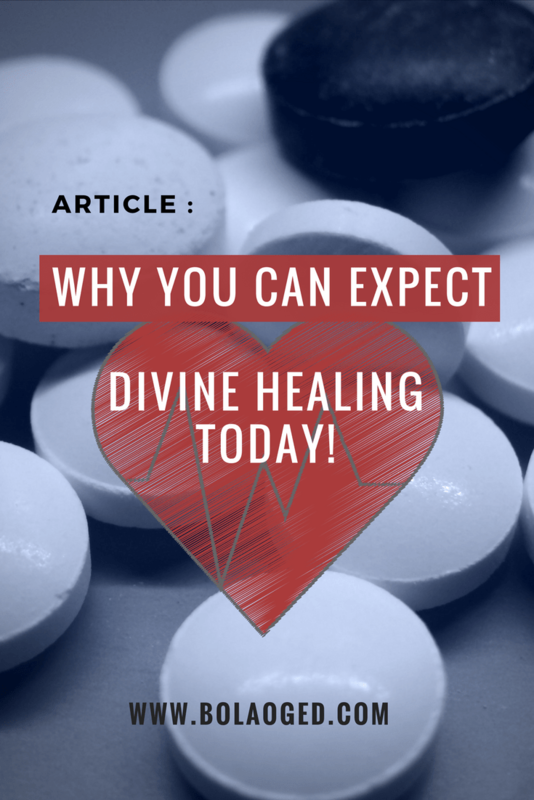 Share this article with someone who needs healing or needs understanding on the subject of healing. This article is an excerpt from the chapter ‘Delivered from sickness’ from the book REBORN: A New Identity. Find out more here. Get the free workbook here. The one returned to testify and why it matters!